We are here to help you answer your questions and to use our print and electronic resources to find the information you need. Librarians can assist you in person, on the phone, and through e-mail. The Reference Department is located on the second floor of the library and is staffed during library hours. You can email your question to Sarah Lauderdale, Head of the Reference Department by sending your question to slauderdale@hwlibrary.org. It may take up to 48 hours for a response. Nine computers with access to the library catalog, the Internet, Microsoft Word and Excel are available for public use on the second floor, near the Reference Desk. Click here to read our Computer Use Policy. The library also offers wireless access to the Internet on both first and second floors. For more information, please see our Wireless Network Information below. Your library card entitles you to access thousands of full-text magazines and newspaper articles, encyclopedia and reference book excerpts, TV and radio transcripts, e-Book collections, downloadable audio books and fiction guides. Our Electronic Resources include resources purchased directly by the Hamilton-Wenham Public Library, such as Ancestry Library Edition (available only in the library), Booklist Online, Global Road Warrior, Heritage Quest, Freegal, Hoopla, Flipster, and more. Other electronic resources are funded by the Merrimack Valley Library Consortium (MVLC), the Massachusetts Board of Library Commissioners, and the Massachusetts Library System. There are current genealogy books and information in the reference area. The Dewey Decimal numbers for genealogy books are in the 929’s. We also have pamphlets listing pertinent books and web sites. In addition to our Rocket Languages online tutorial program, and to various print and audio language learning materials, our library also offers the extensive IN ENGLISH video language learning course: an excellent tool for personal learning and for teaching ESL, regardless of language of origin. DVDs are available through our catalog; PDF workbooks for the DVDs can be downloaded here. Be sure to match the right DVD with the right workbook! 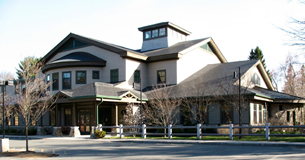 Visit our Local History page for information about the Local History collection at Hamilton-Wenham Public Library. We have a variety of holdings pertaining to the history of Hamilton, Wenham, and the area around the two towns, as well as other communities in Massachusetts. This includes items that can be checked out, items that must be viewed within the library, and items that can viewed any time online. The Local History page offers more particulars, but you can also inquire with the reference librarian on the second floor or call 978-468-5577 to find out more. Visit our Magazines and Newspapers page for information about the titles to which our library subscribes. You may also access articles from the Boston Globe (1980 to present) and thousands of magazine articles via EBSCOHost and InfoTrac, both available through our Electronic Resources page, or register for a Boston Public Library eCard to access electronic newspaper and magazine holdings through the Boston Public Library. Except for the newest releases, which are located in the New Book section on the first floor, all music CDs and tape cassettes are kept in spinning racks on the second floor. Click here for a complete list of our CDs. The non-fiction collection is located on the second floor of the library. These books are organized by subject and shelved by Dewey Decimal number. For example, you can find books on medicine in the 610s. Biographies are located at the end of the non-fiction collection. These books are organized by the last name of the subjects, or biographees. They have a call number of “B” followed by the subject’s last name. Young adult non-fiction books and young adult biographies have a Y designation and are interfiled with our adult non-fiction collection. For example, you will find Y 808.02 HEN (The Young Writer’s Guide to Getting Published by Kathy Henderson) side by side with 808.02 MAG (Getting Published by David Magee). Children’s non-fiction books have a J designation and are on the first floor in the Children’s room. Hamilton-Wenham’s OV (Oversized) collection is divided into two groups due to space considerations. OV Red Dots and OV Yellow Dots alternate, spending half the year on the first floor in Periodicals and half the year in our second floor Closed Stacks. If you are unsure of where an OV book is, ask a librarian. If you need one retrieved from the Closed Stacks, ask a librarian. Here is an example of a call number for the OV book Titanic: Triumph and Tragedy by John Eaton: OV 910.4 EATON Red Dot. We have two black and white copiers, one on each floor. They print traditional 8×11 and 8×14-inch copies. Black and white copies are .15 cents a sheet. Payment must be made by cash or check. Ask at the first floor Circulation desk for use of our color copier. Color copies are .25 cents a sheet. It is possible to print color or double-sided copies to our first floor color copier. Please tell staff first when printing color or double-sided copies, as the print settings will need to be changed. Color copies are .25 cents a sheet. Wireless black and white printing is available in the library for patrons who register for the service. Please ask staff for assistance in printing wirelessly. You can also save your files to a flash drive or other form of personal storage and use one of our public access computers to print. Our Reference Collection is located on the second floor of the library and contains over 800 volumes of print materials. Reference books all have a call number that begins with “R” and a yellow sticker on the spine label that says “Reference”. These books can not be checked out. The library has three study rooms on the second floor. Two of the rooms are for one or two people and the third room can hold as many as six people. The rooms are available on a first-come first-serve basis and may be used for up to three hours a day. To use a study room, patrons must sign in for it at the reference desk. The library has paper copies of the state and federal tax forms on the second floor of the library near the reference desk. You can also find reproducible versions of most tax forms at the following web sites. The library offers wireless “WiFi” access for users with properly equipped laptops. Please see our Wireless Access Point Policy for more information.